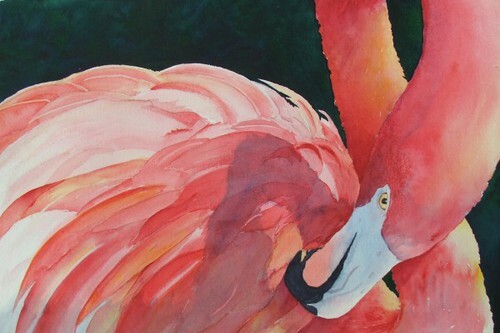 One of Florida's Flamingos, keeping an eye on the viewer as it preens it's feathers, is the subject in this somewhat contemporary, original watercolor painting on 300# paper, measuring approx. 22W by 15H, matted to 28W by 22H and signed by the artist, and is being sold unframed. It will be shipped flat. I do have giclee prints available in a few sizes, from $30.00 in a mat. If interested in a print, please contact me for further information.